As former head of the Saudi Arabian General Investment Authority (SAGIA), Prince Abdullah bin Faisal bin Turki Al-Saud was charged with the task of revitalizing Saudi Arabia’s economy. Though it possesses a robust GDP, the kingdom’s economy is heavily reliant upon oil revenues and has struggled to accommodate an exploding population, continued reliance on a non-Saudi workforce, and rising unemployment. Many experts see increased direct foreign investment, especially in key industries such as power, mining, information technology, and water treatment as an important step in expanding and strengthening the nation’s economy. But the doors to the kingdom’s markets have historically remained closed to foreign investors. Recognizing the need to globalize its economy, the government enacted a new Foreign Investment Law in 2000. This legislation aimed to stimulate business inside the kingdom by allowing for one hundred percent foreign ownership of Saudi companies, lowering corporate tax rates, and legally protecting foreign business investments. In conjunction with the new law, the government created SAGIA to promote commerce within the kingdom. After being appointed the first governor and chairman of SAGIA, Prince Abdullah began to campaign aggressively to liberalize and privatize Saudi Arabia’s economy. During his tenure, the nation issued more than 2,000 foreign business licenses, worth an estimated 15 billion U.S. dollars. Prince Abdullah also lobbied to have Saudi Arabia admitted to the World Trade Organization. So far, this effort has been unsuccessful, due in part to the kingdom’s protectionist policies in industries such as oil production and telecommunications, and its inability to finalize a formal trade agreement with the United States. 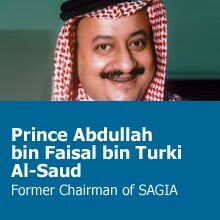 In March of 2004, Prince Abdullah bin Faisal left his post at SAGIA. At least one source speculated that his resignation might have been due to frustration with the government’s bureaucratic mindset and the slow pace at which reforms are implemented inside the kingdom.